The Tektronix 4010-1 is a storage-tube-based graphics terminal. Modern displays store a bit-mapped image in memory that is used to continuously refresh the display. In these terminals the display is stored in the special storage-tube CRT. This allowed complex high-resolution graphics to be displayed flicker-free without needing very expensive memory. Refreshed vector graphics displays were also available at this time which refreshed the display from display lists stored in memory. Since drawing the display took time proportional to the complexity, they were limited in the complexity of display that could be drawn without flickering. The DEC VC8E point plot display was a simple version. Evans and Sutherland made high end units. These links have more information on early graphics: 1980's, end of vector graphics Early graphics history Evans & Sutherland history. The main disadvantage of storage-tube terminals was that it was not possible to change anything on the display. The entire display had to be cleared and redrawn. When text is displayed it can't scroll up the screen. After the screen was filled either it overwrites or you clear it and start over. When the terminal got to the bottom it automatically started at the top shifted over half the screen. Some later units could draw a limited amount of non-stored graphics to allow some update. Also the tube had a much shorter life than normal CRT monitors and was dim. 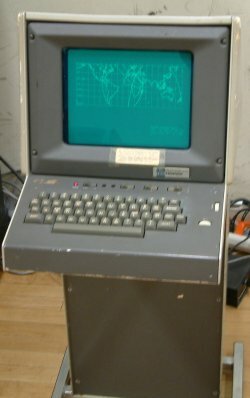 The first Tektronix storage terminal was the T4002 which in the 1971 catalog sold for $8800 without a computer interface. The negative bus parallel interface for a PDP-8/I was $675 and serial was $600. Software for a PDP-8 was $750. By the 1975 catalog the T4002 was obsolete and the current models were the 4010 ($3995), 4010-1 (adds hard copy interface, $4395), 4012 (lower case and hard copy, $5295), 4013 (APL character set and hard copy, $5495), 4014 (15x11 screen, lower case, $8995), and 4014-1 (hard copy, $9495). The 4014 units could be upgraded to 4096x3120 resolution for $700 additional. The 4610 hard copy unit cost $3895 and the paper cost $40 a roll. Also available was an 8-inch flexible disk (floppy) storage unit ($3495 single drive, $5750 dual drive). This took the place of paper tape allowing storage and replaying of data. The unit I have is the Tektronix 4010-1 with hard copy interface option. I have what is labeled a 4631 hard copy unit which I think should have worked with the 4010 but it was modified to be a 4632 video hard copy unit. I am looking for a 4601, 4610, 4611, or 4631 hard copy unit. When you pressed the hard copy button it would scan the contents on the screen with a visible line and send it as analog raster video to the hard copy unit. In the 4010/4631 a single line CRT would expose photo sensitive silver paper which was then developed by heat. Since I don't have a working hard copy I can't show pictures of this. The videos have compression artifacts from the camera I used and compressing for the web site. The blocky stuff you see around the display is not actually present. I need to do more work on the videos and pictures. The Tektronix 4010 pictures from this site are released under Creative Commons Attribution-ShareAlike 4.0 International license. Attribute to David Gesswein and http://www.pdp8online.com/tek4010/tek4010.shtml. The data used to generate the complex plots are from the plotutils package.